Find Better Ideas, Faster ® with a custom modern dad trend report, our PRO Dashboard and 80+ categories of premium trend reports. The Modern Dad Trend Report looks at the countless modern dad trends and how they are presented to us through marketing, advertising and the media. These contemporary representations of dads exist because traditional gender roles are continuing to shift, further blurring the lines between what moms and dads are meant to do. This report will illustrate how millennials are challenging stereotypes and creating new definitions of fatherhood. The Modern Dad Trend Report will be a cherished resource for those looking to gain insight into branding strategies that target millennial fathers. 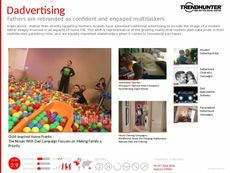 As definitions of fatherhood continue to change, marketers and advertisers are in the position to capitalize on this. 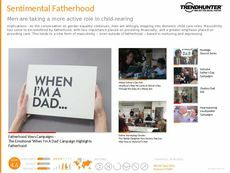 Through Trend Hunter and our report, numerous trends in modern fatherhood will be made available to inspire and inform your team. To better understand the modern dad and this emerging segment, use Trend Hunter's expansive portfolio of modern dad trends to give your business insight and understanding into this untapped market.